3 weeks motorhome holiday ,and a visit to some already visited places and a chance to find some new ones. Not as much discovery as the previous year. Honest this was a holiday in Switzerland (my favorite) with a week either side to see do and relax (drink) as much as possible. England was having such a bad summer I decided at the last minute to escape and return to the mountains of my beloved Switzerland. Camping La Chaumiere, Buysscheure would be the target for the first day and in the end would take 11 hours from door to door including the ferry. The run started at 6 bells and went like clockwork arriving in dover before 1pm and the offer of a free earlier ferry was not turned down. The campsite is a revisit so no surprises were in store and it looked as beautiful as ever the flowers and grassed areas are so well kept, with massive pitches. So well in fact we are going to look at them for another day. This was a day that would start early, Paul had spotted the pool and they would be no stopping him until he had his way, a lovely pool all to ourselves most of the time. We enjoyed ourselves so much that a 3rd night was added, we even packed unplugged and drove to the reception then..............turned round and went back. Another day by the pool and a bike ride to the spot the Eurostar at 300kph (true train spotters now). This option appealed more then driving 230miles in the heat to Troyes. An early start was in order to reach Troyes and get on first come first served campsite, sadly I had discovered a lovely bar in the vilage center last night which sold a unknown light beer that tasted fantastic and buckled my knees. So the early start was a right struggle. No problem getting here autoroute for 200 miles (at a cost of 38&€;, I hate paying tolls) and pitched on camping municipal for 1pm. which was surprising as we had to pass a Mac Arthur Glen shopping outlet a mile from the site. Karen stared and stared but we sailed right on by. Paul was horrified when he spotted the new swimming pool empty, this would enable Karen to get into town for retail therapy. Okay all today was about was to reach Annecy. 270 miles south about 240 on the autoroute at a cost of 47€. Last time I took 2 days to cover the same ground and stayed off the autoroute, more picturesque cheaper but at the cost of a day which I wanted to spend elsewhere. Annecy campsite would not score well with Paul, it lacked a little on kids facilities but being only 0.6mile to town, this is always the price you pay for location. Tonight we would be reminded of home as it poured down, to wet to even sit under the awning, it lasted only an hour or so and the lightening was a marvel to watch (if not scared). Tuesday was spent wondering around the old town, photo after photo and preparing for an early start on the Leffe followed by Moules and fries the best this side of North Shields. Good idea at the time early start required to reach next campsite, as they would only reserve a pitch until 12 noon. Now we had an idea that we wanted to do a bike ride on the shores of Lake Annecy, so get up at 7 bells and do it. I dragged them from their beds relocated the motorhome and set off for 8am ish. The lake side is a delight and a fantastic bike track exists, the views are fantastic, the mountains on the opposite side of the lake would also be our next destination. We were only moving 20 miles to Le Grand Bornand, a small picturesque village with a full rated resort campsite. The campsite was excellent well placed only 200m from town with a wide selection of Bars and restaurants. However these would have to wait for Paul to exhaust himself in the pool ( a full adventure type of play area). Wednesday would see us do our first proper walk in the alps to a height of 1450mto Le Croix. The weather was fantastic at 28c it was maybe a little hot for Paul. A cable car was used for the decent. Mont Blanc !!! this is as close as I will get. This is the end of the tourist trail, after here it's for real. Views as we walked away from the mid cable car station to reach the train at the glazier Mer de Glace. 4.5 miles of the best walking one could wish for, It also included a top of 2202m. The walk is referred to as the Plan de l'Aiguille to Montenvers traverse. It was a bind to leave Le Grand Bornand, and I am sure to return. The morning as spent on a bike ride discovering more advantages to return. We also got the opportunity to watch the the para gliders landing. The route taking to Chamonix Mont Blanc was on the advise of the campsite, high and twisty and it was good in a motor home so I would love to try it on my bike. The route took us through La Cluzaz over the Col des Arivas (fantastic spot) then join the main road at Flumet, passed a good site at Praz-S-Arly, continuing by many beautiful towns and villages and finally reaching one of my all time favorites at Chamonix. Thankfully the owner had kept us a spot, which was just as well as the full sign greeted us at the gate. If you picked good sites just on views this would not be bettered, however it is also close to town and the facilities including free WiFi are of a very high standard No sooner had we arrived that we decided to stop one more night. If fact by the last day we had added more to the total and decided on a lazy day in Chamonix. Time to get a 2 day pass for the lifts and do some high altitude exploring, first day to Aiguille du Midi 3842m and traverse to Montenvers and the second day to walk the other side of the valley between Gares De Planpraz to Chalet de la Flegere cable car stations. also the opportunity to travel in 2 more lifts to admire the views from the tops. The weather has been fantastic at 24c at 6pm in Chamonix is about enough for me. The high spot on the left is the top of the cable car and the one on the right is Mont Blanc...Den told me it was flat between the two and looked a nice walk?? good walking today, traverse between cable car stations at approx 2000m. Gares De Planpraz to Chalet de la Flegere. The view of the cable car we had been on the day before, now on fire. A helicopter worked for the rest of the day bringing it under control. Our lazy day in Chamonix got us to look around bars and the like from which we got the odd good shot of a church among other things. Worth it for the views and this was only on the train to Murren cable car station. Chamonix will be revisited, however it was time to up anchor and move on. Decided on the quick route to Lauterbrunnen and make use of the good weather rather than the good roads. Well this would not go quite to plan as the front nearside brake decided to start and make horrible noises. It turned out to be a broken pad, which took 4 hours to source and change. So the idea of an early beer in the sun never happened. Eventually getting pitched for 8pm on a busy Lauterbrunnen site just in time to watch the sun going down was as good as it gets today. Big time tourists would started in earnest today, as we took the decision to visit the Schilthorn revolving restaurant at 10,000 ft once used in the James Bond 007 movie "On Her Majesty's Secret Service". I have to say it was fantastic day out very smart and with a good restaurant with 360° views over the space of about 30 min's. The best shot of a base jumper we got ..these guys were unbelievable throwing themselves off the 500m rock face below. A 10 mile bike ride, a cable car to Gimmalwald to walk and back the same way was as good as it got today. The sun was shinning and the world was a beautiful place. Less touristy here and very nice for it. The train journey was excellent and took us close, but eventually we had to alight and start to walk... 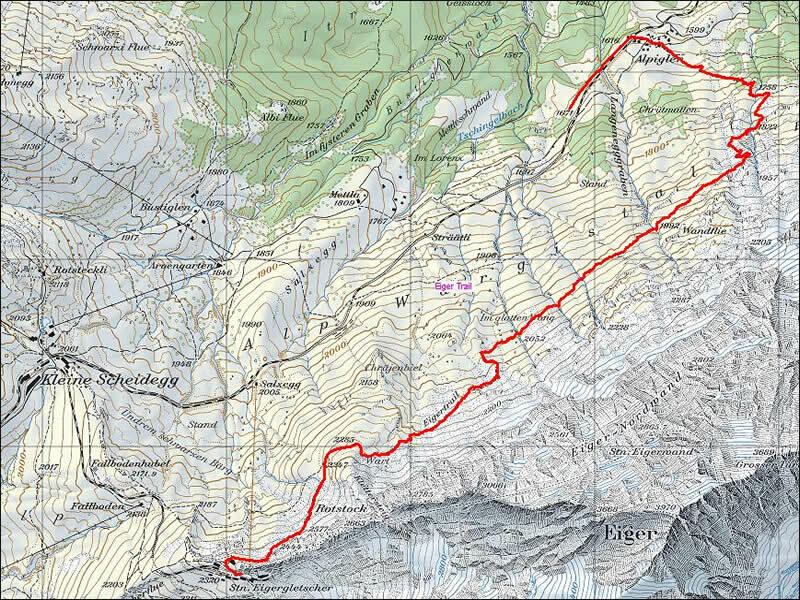 This was the mission to walk along the north face of the Eiger, and this was Karen wanting her bit of the North Face. Okay another photo of the North Face, but it is nice. 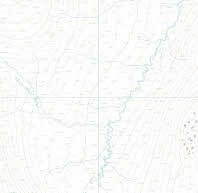 I think our route was nearly like this .....except horizontal along the bottom! Outside Hotel Victoria Interlaken, It's always nice to look. Sunday morning and the cloud hung over the campsite but was clear above, eventually burned off but we were long gone above it all. What it is all about the view from my chair out side the motorhome on our last night. The wonderful Eiger. Time to move, it was raining and we wanted to look around Interlaken so it was decided to see the area from the other side of the valley at Grindlewald. A fantastic place, campsite has wonderful views of the Eiger and the town has shops. Also moving in motorhome is not a big problem. After a few showers on the Friday it was a shame to see damp clouds on Saturday and a planned day was put on hold to the Sunday. Sunday was a different day fantastic, up early and on the bus before 9am to Grosse Shieidegg and a walk to First to try out the "First Flyer" a aerial runway that you get strapped into and travels at 50mph over 800m. Paul thought it was fantastic. Then it was back to base in the cable car. Next problem one day short equals two long drives to get home. The drinking water fountain at the campsite, the constant flow of water keeps water cold. Campers use it to keep their beer cold. Somehow not sure if the honesty bit would work at home. If you look slightly to the left of the view of the Eiger you can do this one....Bye bye campsite. 7am Monday and it had to happen, 600 miles away in the back and beyond and you have got till 4pm tuesday to drag the bus fully laded back to Ijumden for the ferry home. My only thoughts are to ring the ferry company and put it back a week. Progress excellent and sited for 4pm, a good spot by the side of the Rhine accessed by a short car ferry ride. The town is excellent small enough to have a good wonder and large enough for choice. The meal in the "Drosselgasse" district was the best for a long time, even if Karen did spent twice as much on drink (fancy coffees) as she did food.........It was the last night. What can you say it was a boat home, okay it's better coming into the Tyne than into Dover. From a 8am start arrived after a lunch stop at 2.30pm. in the rain, as it happened we had some proper heavy rain on the way in and still covered ground in good time. Conclusion... An excellent faultless holiday apart from one brake pad wish I had done 4 weeks so sad to be heading home.